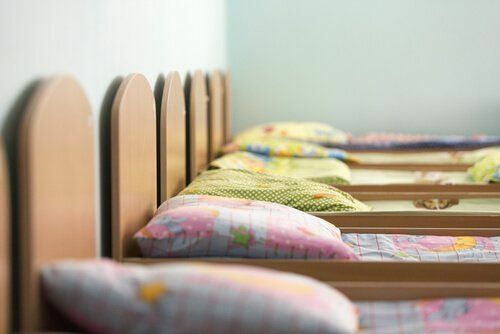 Whether you need extra space for extended family, grandchildren or guests with lots of little ones, finding room for extra beds can be challenging. Always think about the age of your typical visitors. If you want to accommodate adults and kids, consider using a “twin-over-queen” bed setup. Little ones can climb up top and the adults can stretch out more comfortably on the lower level. Place ready-made bunks end-to-end. With simple bunk beds from your local furniture store, painted white and positioned foot to foot, you can make room for a crowd without spending a lot of money. Fill those corners. To make the most of a compact room, consider positioning bunks in the corner. With this approach, you can free up enough space for a desk, dresser or even a small play area. You also can use flush-mount sconces to provide reading light in the bunks without taking up valuable floor space. Triple-decker. Another small-space option – especially for those who have high ceilings – is to triple up on bunks. When going this route, be sure to use secure rails, keep younger kids in lower bunks and think about positioning a larger bed (full or queen size) perpendicular at the bottom. It’s also worth it to have a professional anchor it to the wall and inspect it for safety. Color-coordinate. In a room with three or more beds, having bedding and a rug that fit within a limited color palette can keep the space feeling tidy and spacious. To keep bed-making as simple as possible, consider going with just a fitted sheet and duvet. The best way to go about remodeling bedrooms in Scottsdale is not to hear it from the contractor, but to hear it from their clients. In fact, some of our Republic West Remodeling customers have been kind enough to share their stories with you.